Super challenging 7 element obstacle course for multiple players! Almost 100 feet long nonstop fun for all ages! New safety features include sunscreen windows on the side to make it easier to supervise younger participants. 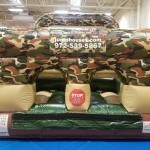 Made from durable lead free vinyl, camo inflatable obstacle course will make any event or party special! Jump City delivery team can safely set up this camouflage obstacle course on either grass, pavement or indoors. 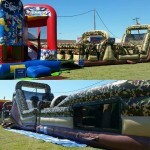 Camouflage design makes this obstacle course a number one choice for many popular theme parties. 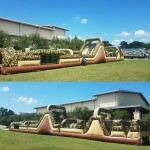 If you are planning a country, hunting, military boot camp theme event call Jump City to reserve this camo obstacle course!